This is the messenger Gabriel announcing to Mary that she will become the mother of Jesus. A popular topic throughout western art over the last thousand years or more, so I thought I might give it a go, so to speak. I've been reading about Angels lately and it's extremely fascinating (I recommend it.) 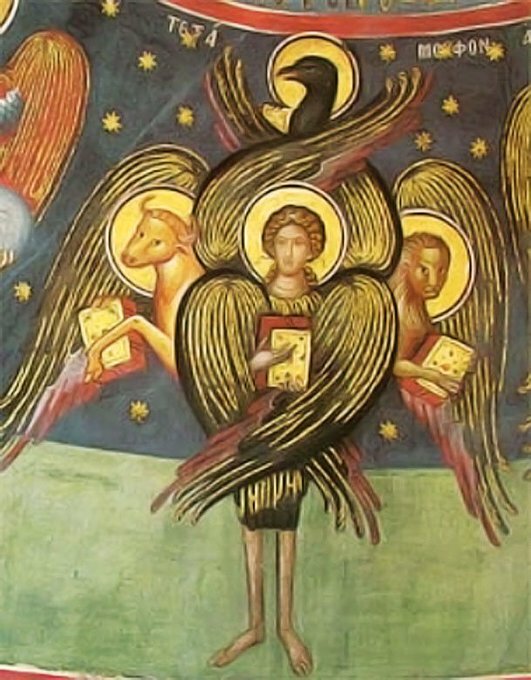 For example did you know cherubim and seraphim are beings of clarity, brightness, tireless ardour and cleansing fire, who with that fire enlighten others and furthermore are reported to have six wings? (Two for covering their feet, two for sheltering their head and two to fly with). I also read that seraphim are caretakers who constantly fly around God's throne singing to each other in exclamation 'holy!' 'holy!" 'holy!' (please take a moment to visualise or even enact this charming vision, I guarantee you will laugh). It's pretty nice. My version of Gabriel is taken from the Annunciazione by Leonardo Da Vinci, with a few obvious differences such as the size of the wings, the angle of his torso and his face. I was reading that they weren't sure for some time if it really was Leonardo's painting, as it is less human, less 'perfect' than his later work. deciding in the end that it was his youthfulness that mades Mary a little less 'warm' in the face than his later Marian renditions, also he painted it over a very long period of time so it doesn't have the impetus and vivacity that comes from a continuous burst of creativity. Regardless it is a beautiful painting, though I couldn't see his wings being large enough to get much lift, hence my adjustment. This is Youssouf. Turtle. Tortoise. EChep Peut! if you are Merlin. He likes to dig. Youssouf not Merlin. Merlin likes to pee in Youssouf's box. =( Couldn't express your distain any more clearly if you tried. I would draw the sticks but I am so distraught with the latest developments that I am not sure I can for a little while. Sticks 2 and 3 went on a nighttime excursion for PINE TREE. The smell was obviously so intoxicating that they made a B line the first chance they could get. Mammal (me) was so gripped watching Ray Donnovan season 3 last three episodes until the wee hours and crawling off to bed bleary eyed, that she forgot to cover them over and LO and BEHOLD. Two sticks gone. A first day of searching gave no result but day 2 I found a very happy stick just chilling out on the outer skirt of the tree. So that night I (mammal) put some fresh Blackberry leaves under the Pine tree (christmassy in nature) and was hopeful with a prayer that Stick no 3 would also be safely found and returned to the dwindling flock. But this morning, while merrily inspecting the tree, having noted some mysterious brown dark patches on the sea grass matt, did see what appeared to be a very short green stick. OH NOO. It was legless and STILL ALIVE. I wailed for a bit and so painful was it to see that I had to go back to bed. Its guts were hanging out and it was in pain, but I couldn't euthenase. I just picked it up in a tissue wandering if they could grow back an abdomen as well as the odd lost leg. And fell into a grief stricken sleep. Merlin and I don't fall out very often but I couldn't congratulate him on this. he has yowled a lot today in between dashing up and down for attention I assume. No one told me that taking on my brother's sticks would involve so much heart-break and drama. AT LEAST sticks 1 and 2 still have each other. They are social creatures after all. And we still have 30 or so eggs. Apparently they tend to hatch just as the adults die off at a rate of about 20% success, so here's hoping. I am sure at least one or two of the adults that have died left us due to old age. Anyway. Youssouf is going to out-live us all which is weird. Merlin is lately living a sort of horror show, and sadly the stick paid the price. AT LEAST I CAN KILL SOMETHING I am sure he thought as Youssouf for him is rather hard to fathom. I saw him jump up at the fish today too. It's all gone a bit haywire. Hopefully tomorrow peace will return. We're a sensitive crew in our house. PS Youssouf is ONE of his names, like Merlin he has two but this one is in honour of his likely Afghan origin. They get picked up as babies and sold as pets =(. He might have been UK reared I don't know as I took him in as he was homeless, Youssouf apparently means "Allah increases in piety, power and influence". I just looked it up in Wikipedia. Its the Arabic version of Joseph. A christmas tale if you will. Just a bit different. ​Unedited as I am hungry and want to watch a movie.